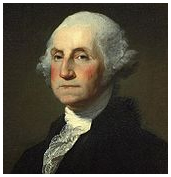 George Washington was the first President of the USA and served in the position between 1789 and 1797. He was aptly called the father of his nation for the important role that he played in the formation of the USA. George Washington was instrumental in forcing the British forces out of Boston as the commander-in-chief of the revolutionary forces. After successfully negotiating with the French, and holding together a fragile and weak army, he was able to save the nation from disintegration and defeat. After the war ended in 1783, George Washington retired from public view and settled down in his plantation at Mount Vernon, surprising many with his action. George Washington played a key role in drafting the Constitution of the United States in the year 1787. As president, he set up protocols in the new government's executive department. His singular aim was to create a nation that would stand strong even with the war between Britain and France. The Proclamation of Neutrality under his leadership in 1793 clearly spelt out the country's stand of non-involvement in conflicts of foreign nations. His other reforms included support to set up an effective tax collection system, creation of a national bank, and reducing the nation's debt to build an economically strong country. In spite of severe opposition, he avoided war with Britain at all costs and maintained peace for over a decade with the Jay Treaty that was put together in 1795. As Washington's farewell address was clearly a lesson on republican virtue and warning against support of war in foreign nations and sectionalism. Washington died in 1799. He has been consistently ranked as one of the greatest US presidents and was the recipient of the very first Congressional Gold medal. George Washington was born on 22nd February as the son of Augustine and Mary in 1732 in Virginia. He was educated at home and grew up in a society of tobacco farmers, many of whom were bonded Africans and African Americans. He worked as a surveyor in his younger days and gained a deep knowledge of the terrain in Virginia. He started his career as a planter and was appointed surveyor of a county in 1749. He accompanied his half-brother Lawrence Washington on many surveys. After the death of Lawrence in 1752, George inherited a part of his estate and started functioning as an assistant of the colony. Washington later went on to become a leader in the Virginia militia in1752 and also gained considerable experience in the subsequent years. He once ambushed a French group of 30 but was later captured. Subsequently, after the release he resigned his position from the Virginia militia. In a major effort to retake Ohio from the French in 1755, Washington's companion Braddock was killed and the expedition ended disastrously. He was instrumental in evacuating the French from Fort Duquesne in 1758. Thereafter, in the same year, he gave up service in the military and went on to live the next 16 years as a planter. He married Martha Dandridge, a wealthy widow, in 1759 believed to be a distant relative. They raised two children from her previous marriage John and Martha Parke Custis, though they never had any children of their own. His real estate holdings and social standing increased and owned about 6500 acres of land by the year 1775. In 1758 he was elected to the Virginia provincial legislature. He led a luxurious life, complete with fox hunting as a leisure-time activity. He survived the unpredictable tobacco market through diversification and switched on to wheat as the primary crop instead of tobacco. He also started spinning, weaving, and horse breeding as other diverse operations. He stayed away from politics for the next few years and concentrated on business. In August 1774 he was selected as a delegate to the first sitting of the Continental Congress. In the next year Washington was appointed Commander-in –chief by the Congress. The Continental Army under Washington played a major role in seizing New York from the British. Though defeated, he staged a counterattack and led the American forces to victory in New Jersey and Trenton. Many youngsters were inspired to join the army after this victory. The Treaty of Paris in 1783 endorsed the British support in recognizing independence of the United States. After many subsequent battles, the British finally were forced to evacuate from New York on 25th November 1783. Washington then disbanded his army and resigned his post as commander-in-chief and retired to Mount Vernon for a brief period. In 1784 he attended the Philadelphia Constitutional Convention and was elected its president. The delegates of the convention thereafter designed the presidency with him in mind and allowed Washington to define the office after the election. The new constitution that was drafted was ratified by all the 13 states. He was elected by the electoral college in 1789 and 1792, both with 100% votes, the only president to enjoy this privilege. He took the official oath as the first ever President of the United States on April 30, 1789 at the Federal Hall in New York City. He was known to have initially declined a salary of $25000 per annum and had wanted to serve the nation as a pure public servant. However, he accepted it on compulsion and made a serious attempt to cut down on all other royal extravagant practices. He preferred the prefix 'Mr. President' to all other titles that were suggested. Washington encouraged debates before taking any major political decisions and was known to be an efficient administrator. He was systematic and organized in his affairs. He served as president for a second term with reluctance and refused to take up a third term. The two terms for a president later became a customary policy and subsequently a law. He returned to farming after his tenure as a president. Washington died of an acute attack of pneumonia on December 14, 1799, aged 67 years. He was buried in the tomb in his estate. People throughout the world mourned his death and it is significant to note that Napoleon ordered 10 days of mourning in France. A funeral was held for George Washington on the 18th of December 1799 in Mount Vernon.